Need a quick, easy, elegant and unique way to wrap up jewelry, homemade candy or handmade creams, balms or scrubs? Check out this elegant and super fast wrap up using metal tins. You can stack as many tins as you want. I chose 3 for a pair of earrings, a bracelet and a necklace. I just love how this looks. I grabbed 3 varied sizes of tins from my stash. As you can see, they're not new. There are a few dings and I actually roughed them up a bit more with some sandpaper because I wanted a slightly shabby elegance to play off that gorgeous ribbon. Line the inside of the tin with batting if you're packaging jewelry. Apply stick on magnet strips to keep the tins together. 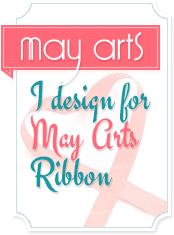 Wrap with gorgeous May Arts Satin Ribbon and Silver Snowflakes. You can add a tag, before tying the bow, if desired. Want some of this yummy ribbon? The Ribbon Lady is giving away 2 prize packs of 1 roll of ribbon and a package of Artful Accents to 2 lucky people who leave comments along the hop. What a neat idea! The silver ribbon is so beautiful! Absolutely in love with this. Love the silver and the snowflakes are perfect. Thanks for sharing with us. Lovely way to give jewelry! love! What and awesome idea. I have some tins, love the snowflake ribbon. Gorgeous ribbon to go with your tins. Thanks for sharing. 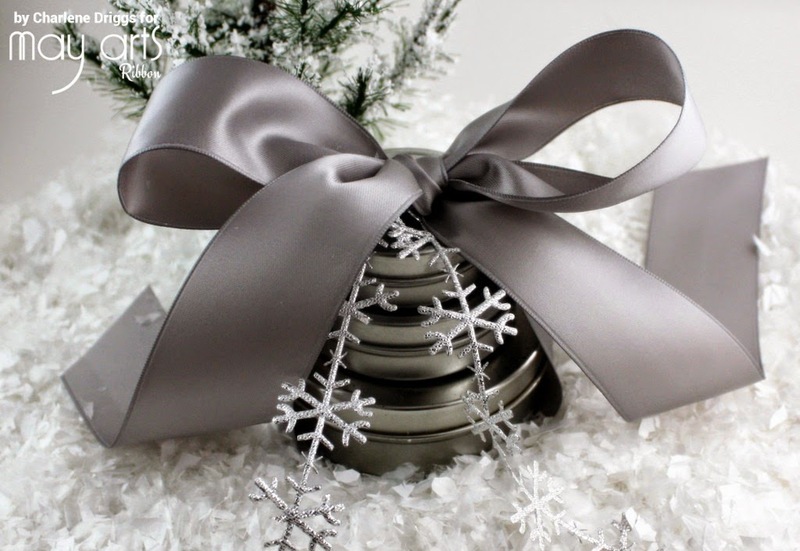 LOVE the stacked tins, SO CLEVER to use the magnets, LOVE the snowflakes and LUSCIOUS bow, together they make for an ELEGANT gift!!! THANK YOU for sharing your DELIGHTFUL gift wrapping inspiration!!! Great idea, love the tins, the magnets, the ribbon. TFs.